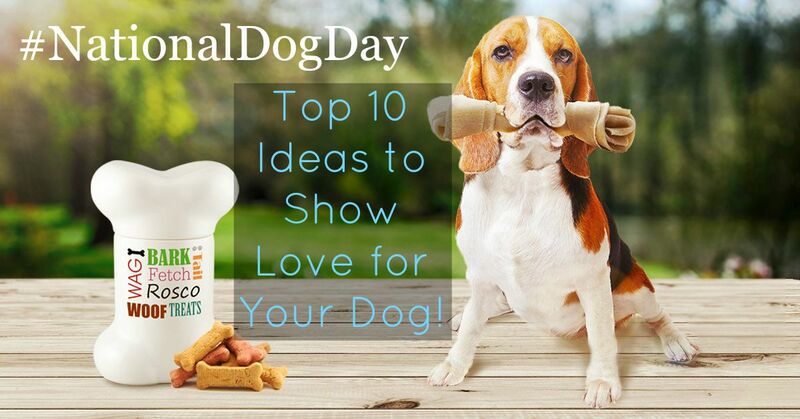 Wednesday, August 26th is National Dog Day so we’re sharing our top ideas to demonstrate our doggy appreciation. Because they’re man’s best friend, we rounded up only the best gifts & tips to treat your dog and strengthen the bond between you and your one-of-a-kind buddy! A stylish and cute way of making sure your canine friend can get back home if lost! This personalized bone shaped collar tag is made out of lightweight and durable aluminum, displaying a delightful pattern of puppy paw prints. 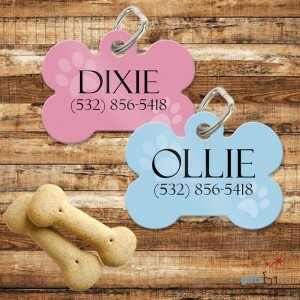 Have your pet’s name personalized along with your phone number, so there will be no doubt to whom your doggy belongs. 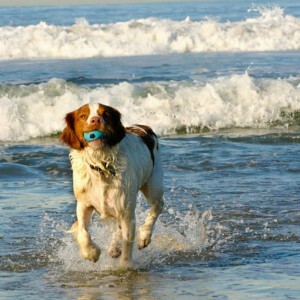 There’s nothing dogs love more than some exercise and quality time with their owner! 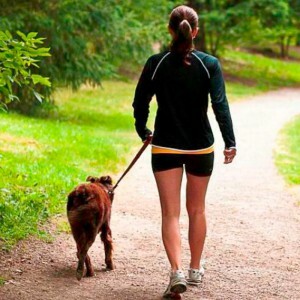 Get your daily work-out in and take your dog out for a scenic walk or jog! You’ll be amazed at what a great work-out companion your dog can be and it gets both of you out of the house and into the fresh air. Show your dog who’s a good boy (or girl!) with this charming ceramic Happy Dog Bone Jar! 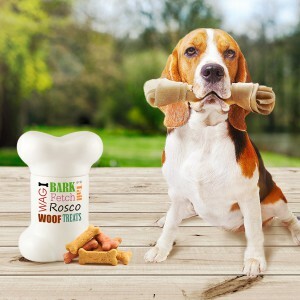 It can hold any type of treat and the pure sight of it will be sure to get your dog’s tail wagging. Personalize the jar with your dog’s name to make it extra special. 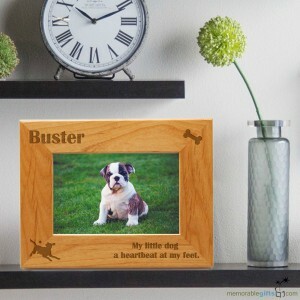 Capture the special memories that you and your dog have shared with our Personalized Dog 4 x 6 Wood Photo Frame. Add your favorite dog photo, name, and two lines for a personal message on the bottom of this engraved dog picture Frame. This is a must-have in any pet lover’s home! Fall may be fast approaching but this summer heat is far from over! Treat your dog to a swim or get them a small pool to cool down in! Even better: go on a weekend getaway to the nearest dog-friendly beach or up to the lake for some nature swimming adventures. 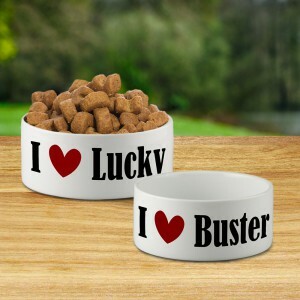 Make mealtime an extra special treat with a Personalized Pet Bowl! This ceramic bowl comes in two sizes – making it great for any sized dog! And did we mention it’s our deal of the week? Personalize this dish by having the dog’s name printed after the heart – now 50% off before August 31st! The perfect gift for all pet lovers! 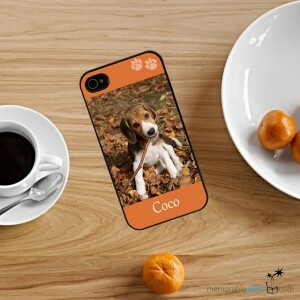 Carry your pet with you everywhere you go with this Paw Prints Personalized Phone Case. Customize the cover with a favorite picture of your lucky pet and 1 line of text underneath the image, plus your choice of four fabulous colors! Also available are Samsung Galaxy Paw Prints Cases. Get together with other dog owners and set up a playdate for your pets! 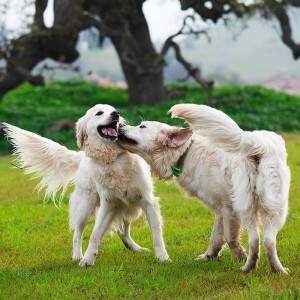 A great way to find playdate potentials is by visiting a dog park and interacting with the other dogs and owners there. Your pet will love getting to interact with some other canine friends and you might make some new friends too! Everyone loves to be pampered – dogs included! 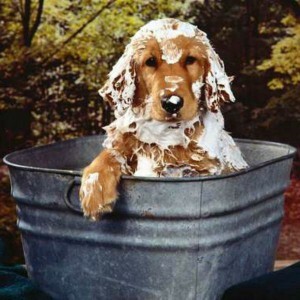 Give your dog a bath or have them groomed so they can feel their cleanest. Set them up with some of their favorite biscuits or treats while they’re getting pampered! Afterwards give your dog some extra belly rubs. It’s never too early to start the holiday shopping! Skip the long lines and wonder no more about what to get your furry little companion this Christmas. 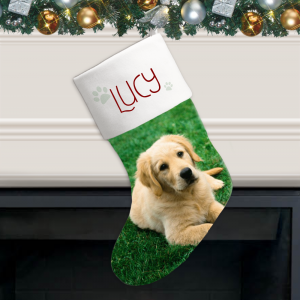 Hang up this personalized Christmas Stocking, customized with a photo of your pet and their name by the chimney and fill it with your dog’s favorite treats for a wonderful Christmas morning surprise!